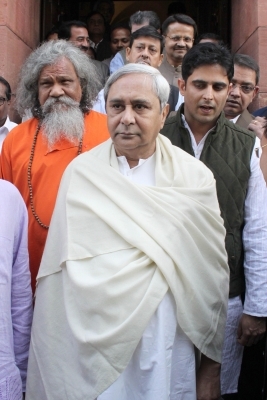 Bhubaneswar, Aug 25 (IANS) The Bharatiya Janata Party (BJP) on Friday alleged that Odisha Chief Minister Naveen Patnaik has fake Twitter followers that have been bought to flaunt his social media clout. “Naveen Patnaik’s Twitter account was opened in 2015. Till June 2017, the figure of his followers was limited to 1.5 lakh,” said state BJP General Secretary Bhrugu Baxipatra. He also alleged that thousands of paid followers, who don’t even know what Twitter is about, have been added as followers to the Chief Minister’s micro-blogging site. “Out of the fresh figure of Naveen Patnaik’s twitter followers, 3,888 followers’ accounts have nil followers and they have not even written a single tweet. These accounts have been created within July and August this year,” said the BJP leader. He alleged that the Twitter account adds as many as 9,000 followers daily while the entire state doesn’t have more than 3 lakh Twitter users. “The CM’s Twitter handle shows it has an average 2.5 tweets per day and with this, how has Patanik accumulated over 6.72 lakh followers so far,” he questioned. Reacting to the allegation, the Biju Janata Dal took a dig at Prime Minister Narendra Modi’s Twitter followers. “There are so many accounts on the Chief Minister’s Twitter handle which are yet to be verified but these are not fake accounts,” said state Information Technology Minister Chandra Sarathi Behera.